The magazine was founded in 1975 as the members' magazine of Calvary Assembly of God in Winter Park, Florida, with Stephen Strang as publisher. In 1981, Strang bought the magazine for $25,000 and broadened its mission to serve the charismatic movement at large. The first year proved to be difficult, with a $100,000 loss, but the magazine later emerged as the "main magazine of the Christian charismatic movement". 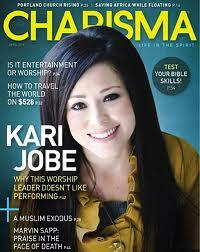 Strang continues to run the magazine today through his company, Charisma Media (formerly Strang Communications). In 1986, Charisma merged with Robert Walker's Christian Life magazine, which had been established in 1948, and Christian Life moved from Du Page County to Charisma's base in Altamonte Springs, Florida. The merger, after which Walker served as a mentor to Strang, was described "a step towards bridging the gap between evangelical and charismatic Christians." Charisma became Charisma + Christian Life, and served as the flagship for Strang's organization. The magazine continued to grow over the subsequent years, and by 1997 it had a circulation of 250,000. With the growth of the magazine and Strang Communications, Strang's influence grew as well, to the point where he was listed by TIME in 2005 as one of "The 25 Most Influential Evangelicals in America". Its current editor-in-chief is Marcus Yoars. The content of the magazine is a mixture of news, interviews, "Christian living" features, Bible teaching, and essays by columnists. Regular columnists include Joyce Meyer, and Don Colbert. ^ James D. Davis (August 17, 2000). "25 Years Reporting 'What God is Doing'". Sun Sentinel. Fort Lauderdale, Florida. p. 1.E. ^ Buursma, Bruce (August 15, 1986). "Magazine gets new home, revitalized approach to youth". Chicago Tribune. p. 5. ^ Kates, Joan Giangrasse (March 14, 2008). "Robert Walker: 1912 - 2008 - Trailblazing Christian journalist - Magazine founder guided by spirituality". Chicago Tribune. p. 11. ^ a b Lawson-Young, Liz (17 March 2008). "Robert Walker: Beyond Paper and Ink". Christianity Today. Retrieved January 7, 2010. ^ Warren, Mindy (April 12, 1997). "Spreading the gospel - Couple believe time is right for African-American Christian magazine". Arlington Morning News. p. 8A. ^ "Stephen Strang". Time. 2005. Retrieved January 16, 2012. ^ "Columnist Bio". Charisma. Archived from the original on February 23, 2009. Retrieved January 7, 2010.